A perfect dessert to complement my Thai grouper fish cakes. Delicious fresh mango flavor to cool your taste buds. Heat the sugar and water in a medium saucepan until the sugar has completely dissolved. Set aside to cool. Cut the mango from the skin. Put the mango pieces, sugar water, and salt into a blender. Blend until completely smooth. Pour into a medium bowl, cover with plastic wrap, and refrigerate until completely chilled. 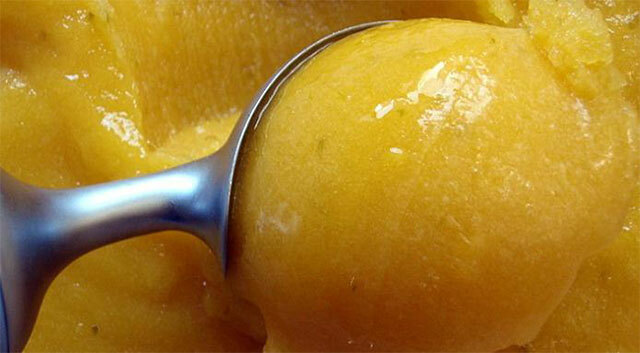 When ready to put the chilled lime mango purée into your ice cream maker, mix in the rum. Process the mixture in your ice cream maker according to the ice cream maker directions. Transfer mixture to a plastic storage container and freeze in your freezer until firm, at least 6 hours.